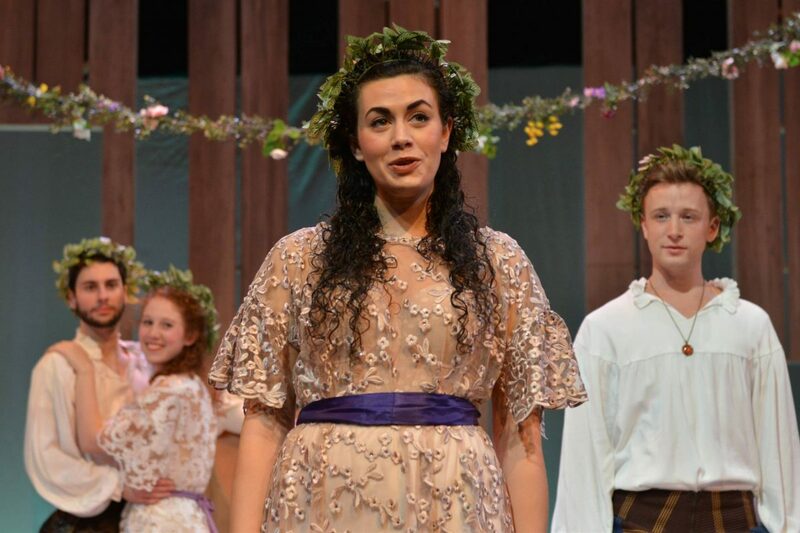 Goldenberg playing Rosalind in As You Like It in 2016. Photo courtesy Jerry Herman Ring Theatre. 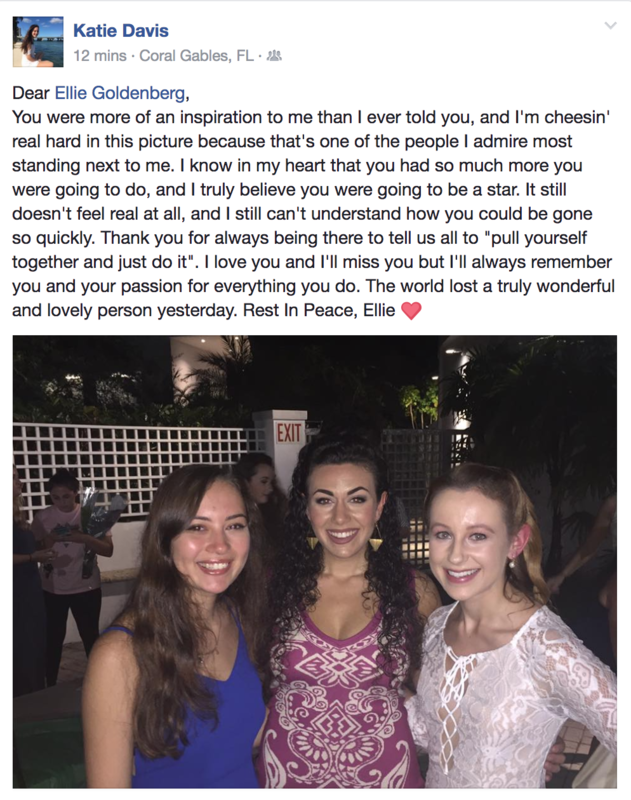 Elizabeth “Ellie” Goldenberg was described by most people who knew her as a “light.” Goldenberg graduated from the University of Miami’s rigorous musical theatre program on Friday, but on Saturday night, she died after a boating accident while on an excursion with her family. 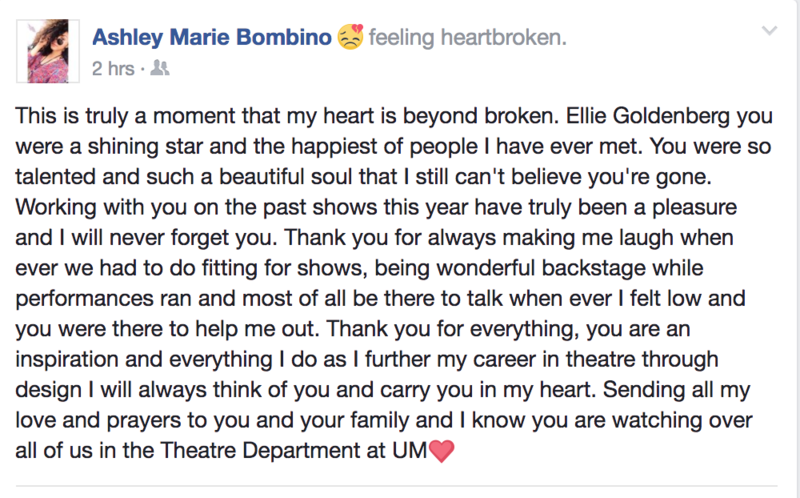 The UM theatre department mourned by posting tributes to Goldenberg on social media, sharing favorite memories and photos. Goldenberg, who first debuted at the Ring in the ensemble of Moises Kaufman’s “Carmen,” went on to play impressive roles in productions like “As You Like It,” “Of Thee I Sing,” and “Spring Awakening.” The actress, originally hailing from Haifa, Israel, also spent a year abroad in her home country while studying at UM. 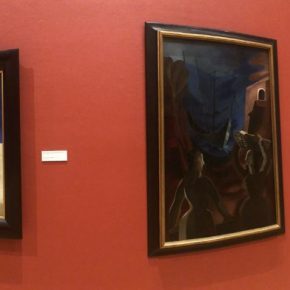 She carried a deep connection to her Jewish heritage even to the theatre, where her family would send Israeli treats to congratulate her on opening night. 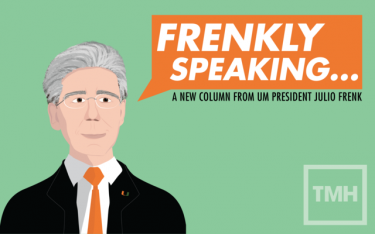 In a recent profile on the university’s College of Arts & Sciences website, she expressed her love for her involvement in Emet Israel and UChabad, a Jewish student organization at UM. 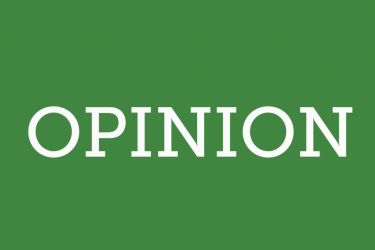 “My heritage is very important to me and I love connecting with other students who feel the same way,” she said. 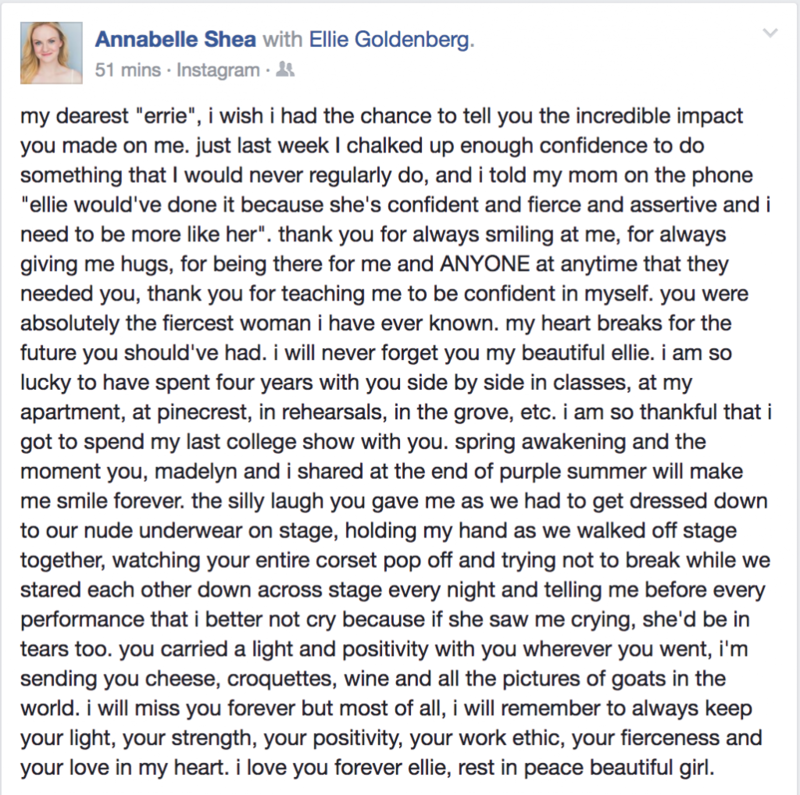 She was often first to get to the theater, partly because she needed plenty of time to prep her thick curls before shows, but also because she cared so deeply about her craft. 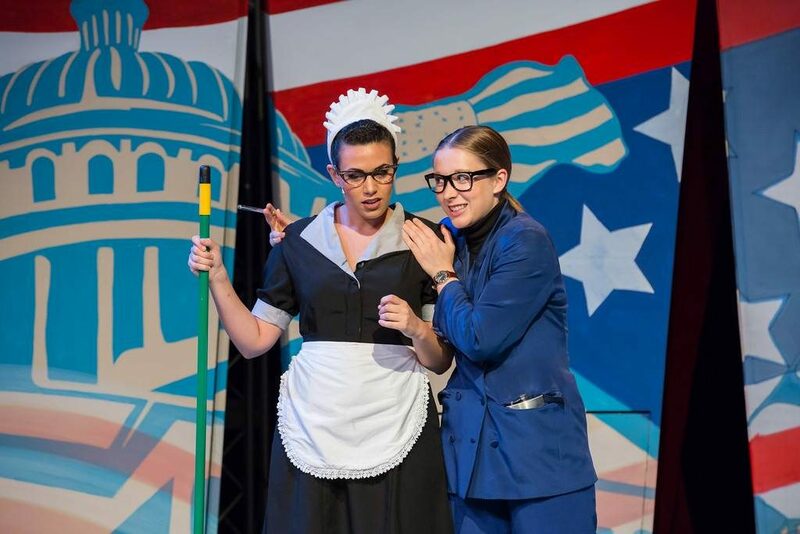 In “Of Thee I Sing,” a musical that played in fall 2016, Goldenberg played a French maid doubling as a French ambassador, shining with her vocals and stage presence. In her scarce amount of spare time, she served as vice president of the Theatre Action Group. Goldenberg (left) and Madelyn Paquette in Of Thee I Sing in fall 2016. Photo courtesy Jerry Herman Ring Theatre. She also played the role of Rosalind in the Ring Theatre’s version of William Shakespeare’s “As You Like It” and was featured in a video to promote the show. 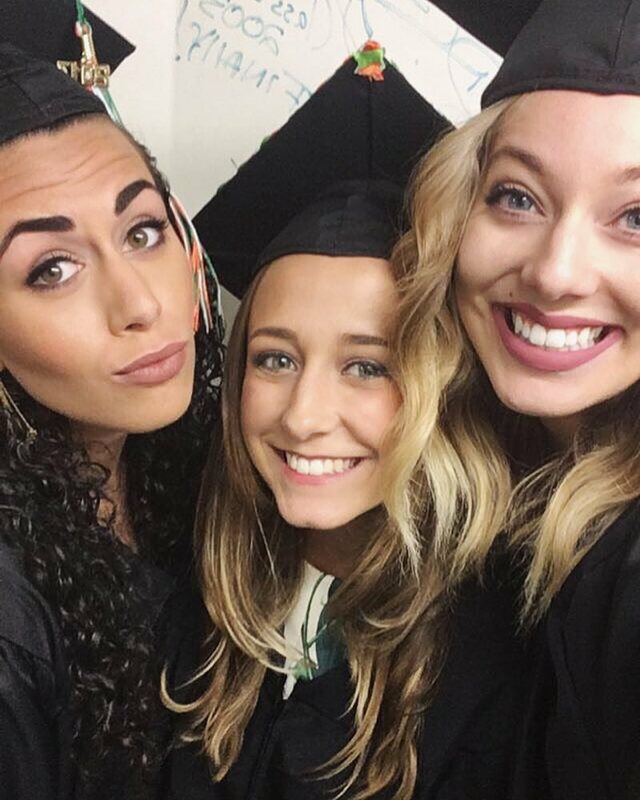 Most recently, she performed at the Ring for the last time as Ilse in Spring Awakening alongside her theatre department mentee, Branden Holzer. 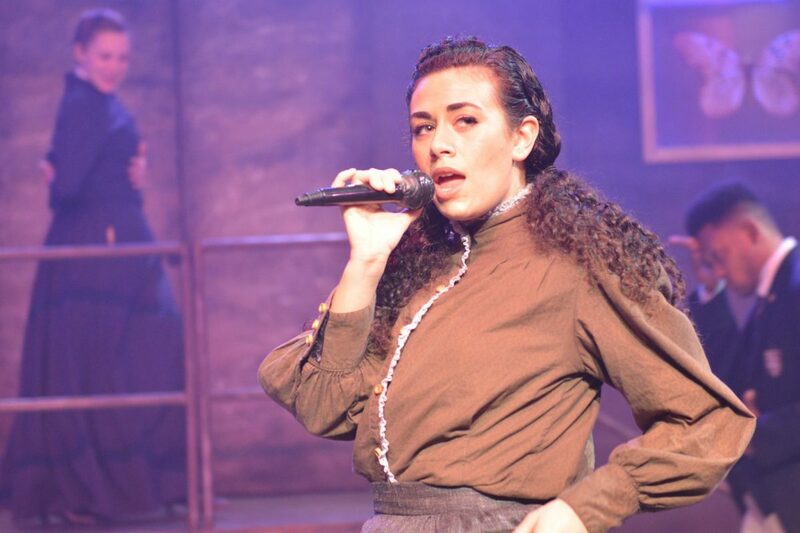 Goldenberg also expanded her performance experience by taking part in productions outside of UM. She said her greatest accomplishment in her time at UM was performing with Broadway performer Jeff Kready in Tom Jones’ “The Game of Love.” The staged reading of the show, sponsored by the Myrna and Sheldon Palley New Musical Theatre Initiative, was put on with less than 24 hours of rehearsal. “This opportunity was presented to the cast with very little notice, which only made the experience more exciting and more challenging,” Goldenberg said. 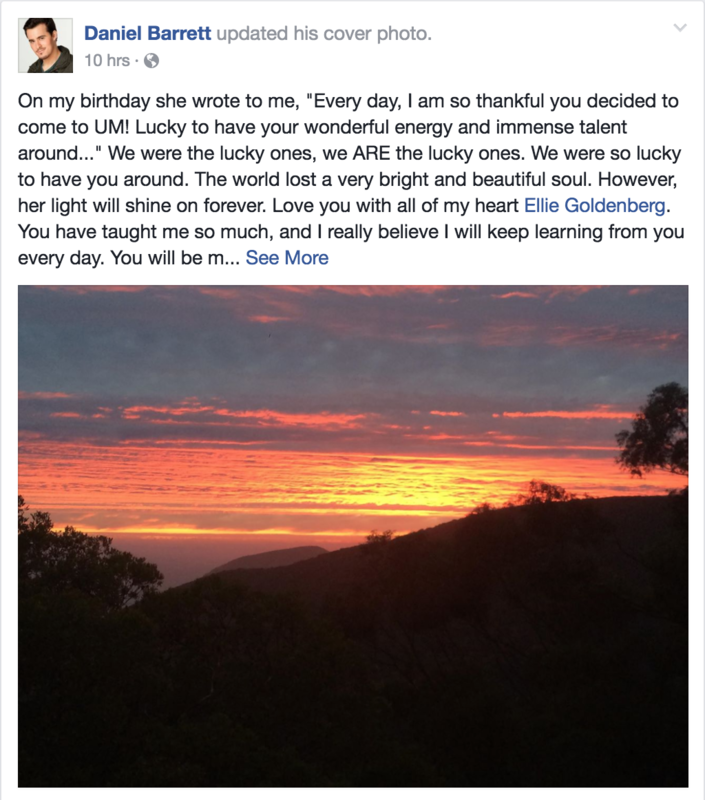 Goldenberg leaves behind her parents, David and Renee, her sister Dana, her brother Michael and his fiancée Emilia. Her funeral will be held on Tuesday, May 16 at 1 p.m. at Kesher Israel Synagogue in Harrisburg, Penn. A memorial service will be held at the Jerry Herman Ring Theatre on Monday, May 15 at 4 p.m. 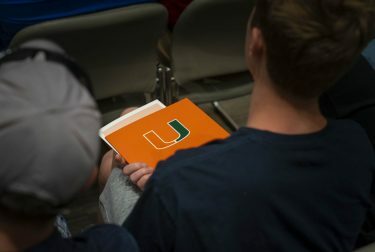 In lieu of flowers, the family has asked for those looking to help to fund planting a tree in Israel in Goldenberg’s name through Keren Kayemeth LeIsrael, Jewish National Fund, or give a donation to the Ellie Goldenberg Memorial Scholarship Fund: Department of Theatre Arts, University of Miami, P.O. Box 248273 Coral Gables, Fla. 33124.